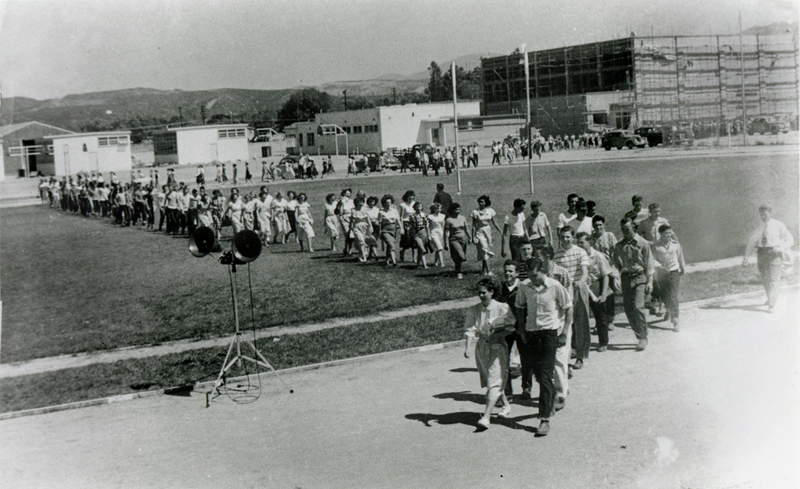 SCVHistory.com AP1422 | Newhall Schools | Hart High School 1950 Commencement Practice. June 1950 — The Hart High Class of 1950 practices for its commencement on the football field. Note that the Hart High gymnasium is under construction in the background at right. The gym was destroyed in the 1994 Northridge earthquake and was rebuilt in 1996 with federal grant money and charitable contributions from members of the community. AP1422: 19200 dpi jpeg from copy print.